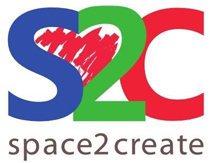 I have been thinking for a long time of Space2Create as a community. It operates like a micro community within the wider local community. So in order to do this I keep spotting signs that suggest a healthy community. It feels healthy when new people are welcomed, supported and integrated into our community regardless of their illness, background, origins, ethnicity, sexuality or appearance. It feels healthy when people who are isolated gain confidence enough to make friends and meet them outside of Space2Create activities. It feels healthy when the community share the fun and laughter with everyone but also share the difficult times and support each other. It feels healthy when the community embraces change and is open to new ideas. It feels healthy when the community work together to clean up or complete a task that needs doing. It feels healthy when the community links to other communities to share ideas and experiences. I observe this frequently at Space2Create so this gives me the hope that this is a good community we have created. In the last month I have certainly experienced this first hand. When I have been having difficulties in my life that meant I was unable to cover my S2C commitments volunteers stepped in to fill the gaps and make sure S2C continued to run. The Service Users themselves helped the volunteers to do this too. I have been shown many acts of support and kindness by everyone, from lifts to and from hospital, cards, meals being cooked for me, coffee out to hear my woes, kind words, covering important meetings, admin, sorting problems to just smiling when I needed a smile. The wider community too has been there to offer help, be understanding when I have not been able to get things done and offer to help me if they can. All I can do is say a big thank you to all who have helped and offered their kind words and thoughts. I see this level of community in other grass roots organisations and communities. I wonder to myself why, if human beings at the bottom of the pile can build strong communities despite the difficulties, can the more affluent and political establishment not do this. At what point does selfishness and self-interest take over? I feel very blessed to live in the community in which I do. The artwork from our community this week……..
« “If I am cut, do I not bleed”………Stigma still simmers.